This is my simple and hassle free version of everybody’s favourite Chinese dish. 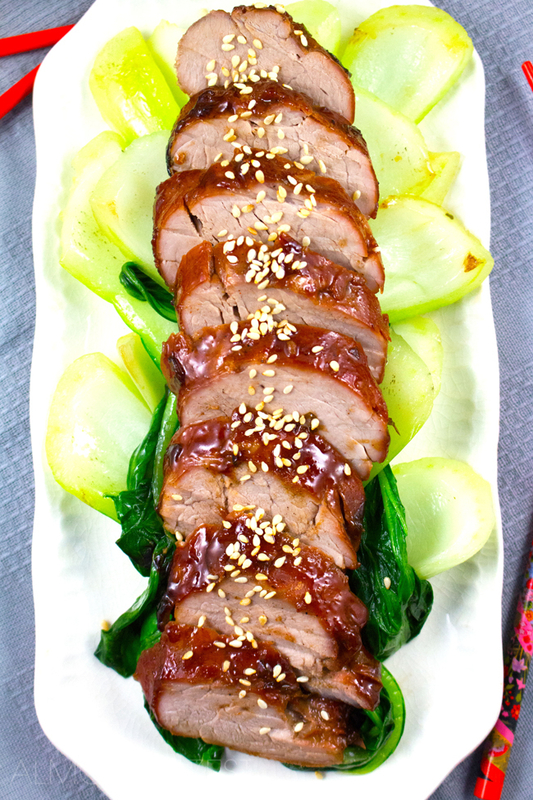 Sweet, moist and sticky Char Siu Pork. Whenever we get Chinese takeaways I always have to order a huge helping of Chinese BBQ Pork. 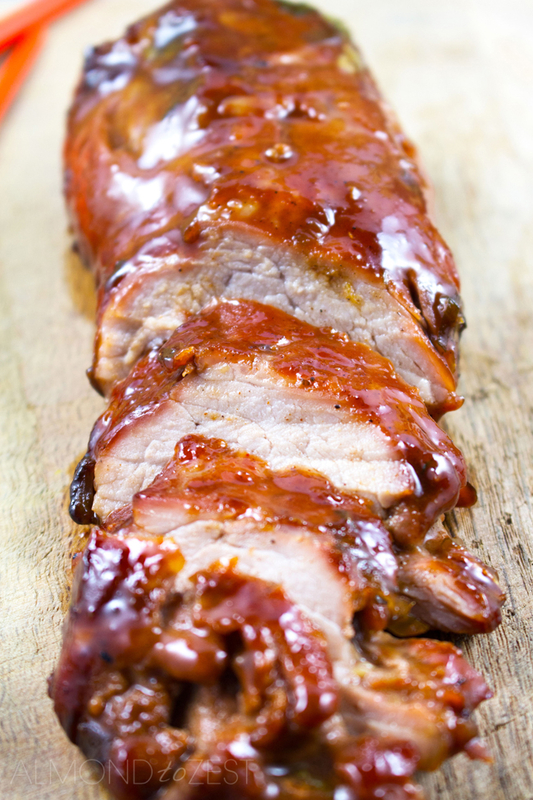 There is just something about that thick, reddish, caramelised glaze that coats the perfectly tender and moist pork that I just cant get enough of. 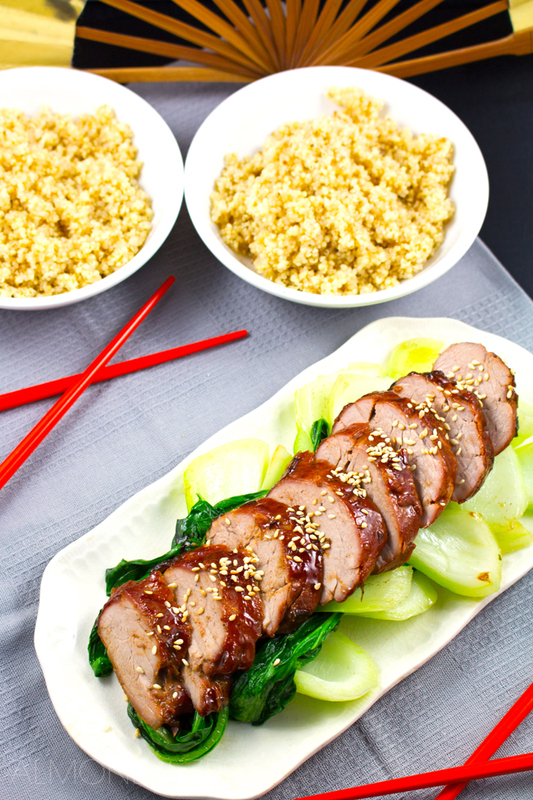 Char Siu Pork is an amazing dish! But eating out can get expensive and it can get pricey when you have to buy a whole lot of Asian sauces to make just one marinade with. So I have come up with my own shortcut version that tastes just like the real thing. All you need is a store brought marinade and a couple of extra ingredients to jazz it up with. It can’t get much easier than that. To make this a complete meal serve this thinly sliced with a good helping of sautéed Asian greens, I have used Pak Choy in the pictures and a bowl of steamed rice or Quinoa. Be sure to check out my tutorial on the best way to cook Quinoa. 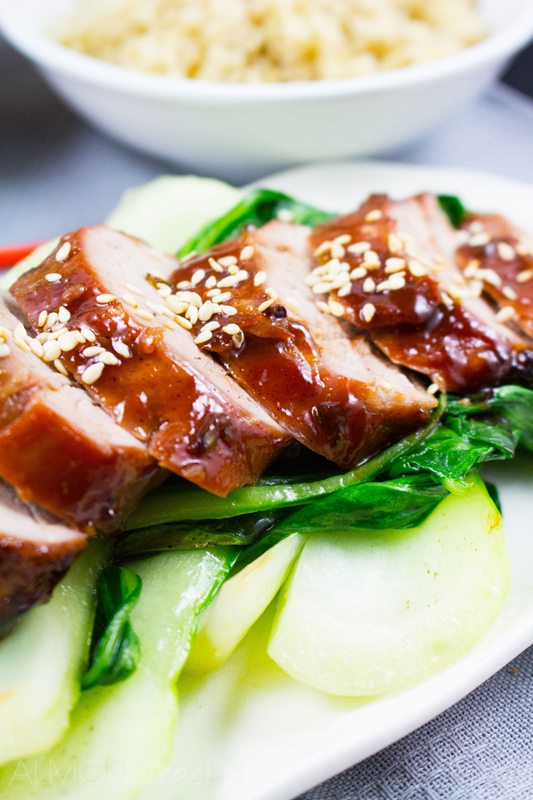 In a bowl mix together the char siu sauce, scallions, Chinese five spice powder, sesame oil and honey until combined. Marinate the pork tenderloin in this sauce and refrigerate for around 2 hours. Heat oven to 400 (200C). Place a rack on top of a baking pan and pour the ⅓ cup of water into the pan. When the pork is ready place it on the rack and into the oven. Cook for 20 minutes then turn the pork and cook for another 20 minutes. Baste every 10 minutes to ensure the tenderloin stays moist. Rest the pork for 10 minutes. In this time gently toast the sesame seeds on the stovetop in a pan. Sprinkle over the pork, once it has rested slice and serve. You want to make sure that you maintain a little liquid in the bottom of the baking dish. This will ensure the sauce doesn’t burn at the bottom of the dish and you have a nice sauce to baste the pork with. As you open the oven to baste the pork every 10 minutes add a little more water if the water on the bottom of the baking pan has evaporated.